The Wright brothers, Orville August 19, 1871 January 30, 1948 and Wilbur April 16, 1867 – May 30, 1912, were two American brothers, inventors, and aviation pioneers who were credited with inventing and building the world’s first successful airplane and making the first controlled, powered and sustained heavier-than-air human flight, on December 17, 1903. In the two years afterward, the brothers developed their flying machine into the first practical fixed-wing aircraft. Although not the first to build and fly experimental aircraft, the Wright brothers were the first to invent aircraft controls that made fixed-wing powered flight possible. The Wright brothers were two of seven children born to Milton Wright 1828-1917 of English and Dutch descent and Susan Catherine Koerner 1831-1889 of German-Swiss descent. Wilbur was born near Millville, Indiana, in 1867; Orville in Dayton, Ohio, in 1871. The brothers never married. The other Wright siblings were named Reuchlin 1861-1920, Lorin 1862-1939, Katharine 1874-1929, and twins Otis and Ida born 1870, died in infancy. In elementary school, Orville was given to mischief and was once expelled. In 1878 their father, who traveled often as a bishop in the Church of the United Brethren in Christ, brought home a toy “helicopter” for his two younger sons. The device was based on an invention of French aeronautical pioneer Alphonse Pnaud. Made of paper, bamboo and cork with a rubber band to twirl its rotor, it was about a foot long. Wilbur and Orville played with it until it broke, and then built their own. In later years, they pointed to their experience with the toy as the initial spark of their interest in flying. Both brothers attended high school, but did not receive diplomas. The family’s abrupt move in 1884 from Richmond, Indiana to Dayton, Ohio, where the family had lived during the 1870s, prevented Wilbur from receiving his diploma after finishing four years of high school. In the winter of 1885-86 Wilbur was accidentally struck in the face by a hockey stick while playing an ice-skating game with friends, resulting in the loss of his front teeth. He had been vigorous and athletic until then, and although his injuries did not appear especially severe, he became withdrawn, and did not attend Yale as planned. Instead, he spent the next few years largely housebound, caring for his mother who was terminally ill with tuberculosis and reading extensively in his father’s library. He ably assisted his father during times of controversy within the Brethren Church, but also expressed unease over his own lack of ambition. Orville dropped out of high school after his junior year to start a printing business in 1889, having designed and built his own printing press with Wilbur’s help. Wilbur joined the print shop, and in March the brothers launched a weekly newspaper, the West Side News. Subsequent issues listed Orville as publisher and Wilbur as editor on the masthead. In April 1890 they converted the paper to a daily, the The Evening Item, but it lasted only four months. They focused on commercial printing afterward. One of their clients for printing jobs was Orville’s friend and classmate in high school, Paul Laurence Dunbar, who rose to international acclaim as a ground-breaking African-American poet and writer. The Wrights printed the Dayton Tattler, a weekly newspaper that Dunbar edited for a brief period. Capitalizing on the national bicycle craze spurred by the invention of the safety bicycle and its substantial advantages over the penny-farthing design, the brothers opened a repair and sales shop in 1892 the Wright Cycle Exchange, later the Wright Cycle Company and began manufacturing their own brand in 1896. They used this endeavor to fund their growing interest in flight. In the early or mid-1890s they saw newspaper or magazine articles and probably photographs of the dramatic glides by Otto Lilienthal in Germany. The year 1896 brought three important aeronautical events. In May, Smithsonian Institution Secretary Samuel Langley successfully flew an unmanned steam-powered model aircraft. In the summer, Chicago engineer and aviation authority Octave Chanute brought together several men who tested various types of gliders over the sand dunes along the shore of Lake Michigan. In August, Lilienthal was killed in the plunge of his glider. These events lodged in the consciousness of the brothers. In May 1899 Wilbur wrote a letter to the Smithsonian Institution requesting information and publications about aeronautics. Drawing on the work of Sir George Cayley, Chanute, Lilienthal, Leonardo da Vinci, and Langley, they began their mechanical aeronautical experimentation that year. Despite Lilienthal’s fate, the brothers favored his strategy: to practice gliding in order to master the art of control before attempting motor-driven flight. The death of British aeronaut Percy Pilcher in another hang gliding crash in 1899 only reinforced their opinion that a reliable method of pilot control was the key to successful and safe flight. At the outset of their experiments they regarded control as the unsolved third part of “the flying problem”. They believed sufficiently promising knowledge of the other two issues wings and engines already existed. The Wright brothers thus differed sharply from more experienced practitioners of the day, notably Ader, Maxim and Langley who built powerful engines, attached them to airframes equipped with unproven control devices, and expected to take to the air with no previous flying experience. Although agreeing with Lilienthal’s idea of practice, the Wrights saw that his method of balance and control shifting his body weight was fatally inadequate. They were determined to find something better. On the basis of observation, Wilbur concluded that birds changed the angle of the ends of their wings to make their bodies roll right or left. The brothers decided this would also be a good way for a flying machine to turn to “bank” or “lean” into the turn just like a bird and just like a person riding a bicycle, an experience with which they were thoroughly familiar. Equally important, they hoped this method would enable recovery when the wind tilted the machine to one side lateral balance. They puzzled over how to achieve the same effect with man-made wings and eventually discovered wing-warping when Wilbur idly twisted a long inner-tube box at the bicycle shop. Other aeronautical investigators regarded flight as if it were not so different from surface locomotion, except the surface would be elevated. They thought in terms of a ship’s rudder for steering, while the flying machine remained essentially level in the air, as did a train or an automobile or a ship at the surface. The idea of deliberately leaning, or rolling, to one side seemed either undesirable or did not enter their thinking. Some of these other investigators, including Langley and Chanute, sought the elusive ideal of “inherent stability”, believing the pilot of a flying machine would not be able to react quickly enough to wind disturbances to use mechanical controls effectively. The Wright brothers, on the other hand, wanted the pilot to have absolute control. For that reason, their early designs made no concessions toward built-in stability such as dihedral wings. They deliberately designed their 1903 first powered flyer with anhedral drooping wings, which are inherently unstable, but less susceptible to upset by gusty sidewinds. In July 1899 Wilbur put wing warping to the test by building and flying a biplane kite that had a five foot wingspan. When the wings were warped, or twisted, one end of the wings produced more lift and the other end, less lift. Unequal lift made the wings tilt, or bank: the end with more lift rose, while the other end dropped, causing a turn in the direction of the lower end. Warping was controlled by four cords attached to the kite. The cords led to two sticks held by the kite flyer, who tilted them in opposite directions to twist the wings. In 1900 the brothers journeyed to Kitty Hawk, North Carolina to begin their manned gliding experiments. In a reply to Wilbur’s first letter, Octave Chanute had suggested the mid-Atlantic coast for its regular breezes and soft sandy landing surface. Wilbur also requested and scrutinized U.S. Weather Bureau data, and decided on Kitty Hawk after receiving information from the government meteorologist stationed there. The location, although remote, was closer to Dayton than other places Chanute had suggested, including California and Florida. The spot also gave them privacy from reporters, who had turned the 1896 Chanute experiments at Lake Michigan into something of a circus. Chanute visited them in camp each season from 1901 to 1903 and saw gliding experiments, but not the powered flights. The Wrights based the design of their kite and full-size gliders on work done in the 1890s by other aviation pioneers. They adopted the basic design of the Chanute-Herring biplane hang glider “double-decker” as the Wrights called it, which flew well in the 1896 experiments near Chicago, and used aeronautical data on lift that Lilienthal had published. The Wrights designed the wings with camber, a curvature of the top surface. The brothers did not discover this principle, but took advantage of it. The better lift of a cambered surface compared to a flat one was first discussed scientifically by Sir George Cayley. Lilienthal, whose work the Wrights carefully studied, used cambered wings in his gliders, proving in flight the advantage over flat surfaces. The wooden uprights between the wings of the Wright glider were braced by wires in their own version of Chanute’s modified “Pratt truss”, a bridge-building design he used for his biplane glider initially built as a triplane. The Wrights mounted the horizontal elevator in front of the wings rather than behind, apparently believing this feature would help to avoid, or protect them, from a nosedive and crash like the one that killed Lilienthal. When Brazilian aviation pioneer Alberto Santos-Dumont flew his 14-bis in Paris in 1906, French newspapers dubbed the tail-first arrangement a “canard”, because of the supposed resemblance to a duck in flight. Wilbur incorrectly believed a tail was not necessary, and their first two gliders did not have one. According to some Wright biographers, Wilbur probably did all the gliding until 1902, perhaps to exercise his authority as older brother and to protect Orville from harm as he did not want to have to explain to Bishop Wright if Orville got injured. * This airfoil caused severe stability problems; the Wrights modified the camber on-site. The brothers flew the glider only a few days in the early autumn of 1900 at Kitty Hawk. In the first tests, probably October 3, Wilbur was aboard while the glider flew as a kite not far above the ground with men below holding tether ropes. Most of the kite tests were unpiloted with sandbags or chains and even a local boy as onboard ballast. They tested wing-warping using control ropes from the ground. The glider was also tested unmanned while suspended from a small homemade tower. Wilbur but not Orville made about a dozen free glides on only a single day. For those tests, the brothers trekked four miles 6 km south to the Kill Devil Hills, a group of sand dunes up to 100 feet 30 m high where they made camp in each of the next three years. Although the glider’s lift was less than expected causing most tests to be unmanned, the brothers were encouraged because the craft’s front elevator worked well and they had no accidents. However, the small number of free glides meant they were not able to give wing-warping a true test. Hoping to improve lift, they built the 1901 glider with a much larger wing area and made 50 to 100 flights in July and August for distances of 20 to 400 ft 6 to 122 m. The glider stalled a few times, but the parachute effect of the forward elevator allowed Wilbur to make a safe flat or “pancake” landing, instead of a nose-dive. These incidents wedded the Wrights even more strongly to the canard design, which they did not give up until 1910. The glider, however, delivered two major disappointments. It produced only about one-third the lift calculated and sometimes failed to respond properly to wing-warping, turning opposite the direction intended a problem later known as adverse yaw. On the trip home after their second season, Wilbur, stung with disappointment, remarked to Orville that man would fly, but not in their lifetimes. The Wrights and Lilienthal used the equation to calculate the amount of lift that wings of various sizes would produce. On the basis of measurements of lift and wind during the 1901 glider’s kite and free flights, Wilbur believed correctly, as tests later showed that the Smeaton number was very close to 0.0033, not the traditionally used 60 percent larger 0.0054, which would exaggerate predicted lift. Back home, furiously pedaling a strange-looking bicycle on neighborhood streets, they conducted makeshift open-air tests with a miniature Lilienthal airfoil and a counter-acting flat plate, which were both attached to a freely rotating third bicycle wheel mounted horizontally in front of the handlebars. Because the third wheel rotated against the airfoil instead of remaining motionless as the calculations predicted, the Wrights confirmed their suspicion that published data on lift were unreliable, and they decided to expand their investigation. They also realized that trial-and-error with different wings on full-size gliders was too costly and time-consuming. Putting aside the three-wheel bicycle, they built a six-foot wind tunnel in their shop and conducted systematic tests on miniature wings from October to December 1901. The “balances” they devised and mounted inside the tunnel to hold the wings looked crude, made of bicycle spokes and scrap metal, but were “as critical to the ultimate success of the Wright brothers as were the gliders.” The devices allowed the brothers to balance lift against drag and accurately calculate the performance of each wing. They could also see which wings worked well as they looked through the viewing window in the top of the tunnel. Prior to beginning their wind tunnel experiments, Wilbur, at Chanute’s invitation, traveled to Chicago to give a speech to the Western Society of Engineers on September 18, 1901. Wilbur’s speech consisted of detailed accounts of his and Orville’s glider experiments at Kitty Hawk up to the fall of 1901 and was complemented by a lantern slide show of photographs. Wilbur’s speech was the first public account of the brothers’ experiments. At left, 1901 glider flown by Wilbur left and Orville. At right, 1902 glider flown by Wilbur right and Dan Tate, their helper. Dramatic improvement in performance is apparent. The 1901 glider flies at a steep angle of attack due to poor lift and high drag. In contrast, the 1902 glider flies at a much flatter angle and holds up its tether lines almost vertically, clearly demonstrating a much better lift-to-drag ratio. Lilienthal had made “whirling arm” tests on only a few wing shapes, and the Wrights mistakenly assumed the data would apply to their wings, which had a different shape. The Wrights took a huge step forward and made basic wind tunnel tests on 200 wings of many shapes and airfoil curves, followed by detailed tests on 38 of them. The tests, according to biographer Howard, “were the most crucial and fruitful aeronautical experiments ever conducted in so short a time with so few materials and at so little expense”. An important discovery was the benefit of longer narrower wings: in aeronautical terms, wings with a larger aspect ratio wingspan divided by chord the wing’s front-to-back dimension. Such shapes offered much better lift-to-drag ratio than the broader wings the brothers had tried so far. With this knowledge, and a more accurate Smeaton number, the Wrights designed their 1902 glider. Using another crucial discovery from the wind tunnel, they made the airfoil flatter, reducing the camber the depth of the wing’s curvature divided by its chord. The 1901 wings had significantly greater curvature, a highly inefficient feature the Wrights copied directly from Lilienthal. Fully confident in their new wind tunnel results, the Wrights discarded Lilienthal’s data, now basing their designs on their own calculations. By 1902 they realized that wing-warping created “differential drag” at the wingtips. Greater lift at one end of the wing also increased drag, which slowed that end of the wing, making the aircraft swivel or “yaw” so the nose pointed away from the turn. That was how the tailless 1901 glider behaved. The improved wing design enabled consistently longer glides, and the rear rudder prevented adverse yaw so effectively that it introduced a new problem. Sometimes when the pilot attempted to level off from a turn, the glider failed to respond to corrective wing-warping and persisted into a tighter turn. The glider would slide toward the lower wing, which hit the ground, spinning the aircraft around. The Wrights called this “well digging”. Orville apparently visualized that the fixed rudder resisted the effect of corrective wing-warping when attempting to level off from a turn. He wrote in his diary that on the night of October 2, “I studied out a new vertical rudder”. The brothers then decided to make the rear rudder movable to solve the problem. They hinged the rudder and connected it to the pilot’s warping “cradle”, so a single movement by the pilot simultaneously controlled wing-warping and rudder deflection. Tests while gliding proved that the trailing edge of the rudder should be turned away from whichever end of the wings had more drag and lift due to warping. The opposing pressure produced by turning the rudder enabled corrective wing-warping to reliably restore level flight after a turn or a wind disturbance. Furthermore, when the glider banked into a turn, rudder pressure overcame the effect of differential drag and pointed the nose of the aircraft in the direction of the turn, eliminating adverse yaw. In short, the Wrights discovered the true purpose of the movable vertical rudder. Its role was not to change the direction of flight, but rather, to aim or align the aircraft correctly during banking turns and when leveling off from turns and wind disturbances. The actual turn the change in direction was done with roll control using wing-warping. The principles remained the same when ailerons superseded wing-warping. With their new method the Wrights achieved true control in turns for the first time on October 8, 1902, a major milestone. During September and October they made between 700 and 1,000 glides, the longest lasting 26 seconds and covering 622.5 feet 189.7 m. Hundreds of well-controlled glides after they made the rudder steerable convinced them they were ready to build a powered flying machine. Thus did three-axis control evolve: wing-warping for roll lateral motion, forward elevator for pitch up and down and rear rudder for yaw side to side. On March 23, 1903, the Wrights applied for their famous patent for a “Flying Machine”, based on their successful 1902 glider. Some aviation historians believe that applying the system of three-axis flight control on the 1902 glider was equal to, or even more significant, than the addition of power to the 1903 Flyer. Peter Jakab of the Smithsonian asserts that perfection of the 1902 glider essentially represents invention of the airplane. In 1903 the brothers built the powered Wright Flyer I, using their preferred material for construction, spruce, a strong and lightweight wood, and Pride of the West muslin for surface coverings. They also designed and carved their own wooden propellers, and had a purpose-built gasoline engine fabricated in their bicycle shop. They thought propeller design would be a simple matter and intended to adapt data from shipbuilding. However, their library research disclosed no established formulas for either marine or air propellers, and they found themselves with no sure starting point. They discussed and argued the question, sometimes heatedly, until they concluded that an aeronautical propeller is essentially a wing rotating in the vertical plane. On that basis, they used data from more wind tunnel tests to design their propellers. The finished blades were just over eight feet long, made of three laminations of glued spruce. The Wrights decided on twin “pusher” propellers counter-rotating to cancel torque, which would act on a greater quantity of air than a single relatively slow propeller and not disturb airflow over the leading edge of the wings. The Wrights wrote to several engine manufacturers, but none met their need for a sufficiently lightweight powerplant. They turned to their shop mechanic, Charlie Taylor, who built an engine in just six weeks in close consultation with the brothers. To keep the weight low enough, the engine block was cast from aluminum, a rare practice for the time. The WrightTaylor engine was a primitive version of modern fuel-injection systems, having no carburetor or fuel pump. Gasoline was gravity-fed into the crankcase through a rubber tube from the fuel tank mounted on a wing strut. The propeller drive chains, resembling those of bicycles, were actually supplied by a manufacturer of heavy-duty automobile chain-drives. The Flyer cost less than a thousand dollars, in contrast to more than $50,000 in government funds given to Samuel Langley for his man-carrying Great Aerodrome. The Flyer had a wingspan of 40.3 ft 12.3 m, weighed 605 lb 274 kg and sported a 12 horsepower 8.9 kW 180 lb 82 kg engine. Five people witnessed the flights: Adam Etheridge, John T. Daniels who snapped the famous “first flight” photo using Orville’s pre-positioned camera and Will Dough, all of the U.S. government coastal lifesaving crew; area businessman W.C. Brinkley; and Johnny Moore, a teenaged boy who lived in the area. After the men hauled the Flyer back from its fourth flight, a powerful gust of wind flipped it over several times, despite the crew’s attempt to hold it down. Severely damaged, the airplane never flew again. The brothers shipped it home, and years later Orville restored it, lending it to several U.S. locations for display, then to a British museum see Smithsonian dispute below, before it was finally installed in the Smithsonian Institution in Washington, D.C. in 1948, its current residence. The Wrights sent a telegram about the flights to their father, requesting that he “inform press.” However, the Dayton Journal refused to publish the story, saying the flights were too short to be important. Meanwhile, against the brothers’ wishes, a telegraph operator leaked their message to a Virginia newspaper, which concocted a highly inaccurate news article that was reprinted the next day in several newspapers elsewhere, including Dayton. The Wrights issued their own factual statement to the press in January. Nevertheless, the flights did not create public excitement if people even knew about them and the news soon faded. In Paris, however, Aero Club of France members, already stimulated by Chanute’s reports of Wright gliding successes, took the news more seriously and increased their efforts to catch up to the brothers. Modern analysis by Professor Fred E. C. Culick and Henry R. Jex in 1985 has demonstrated that the 1903 Wright Flyer was so unstable as to be almost unmanageable by anyone but the Wrights, who had trained themselves in the 1902 glider. In 1904 the Wrights built the Flyer II. They decided to avoid the expense of travel and bringing supplies to the Outer Banks and set up an airfield at Huffman Prairie, a cow pasture eight miles 13 km northeast of Dayton. They received permission to use the field rent-free from owner and bank president Torrance Huffman. They invited reporters to their first flight attempt of the year on May 23, on the condition that no photographs be taken. Engine troubles and slack winds prevented any flying, and they could manage only a very short hop a few days later with fewer reporters present. Some scholars of the Wrights speculate the brothers may have intentionally failed to fly in order to cause reporters to lose interest in their experiments. Whether that is true is not known, but after their poor showing local newspapers virtually ignored them for the next year and a half. The Wrights were glad to be free from the distraction of reporters. The absence of newsmen also reduced the chance of competitors learning their methods. After the Kitty Hawk powered flights, the Wrights made a decision to begin withdrawing from the bicycle business so they could devote themselves to creating and marketing a practical airplane. The decision was financially risky, since they were neither wealthy nor government-funded unlike other experimenters such as Ader, Maxim, Langley and Santos-Dumont. The Wright brothers did not have the luxury of giving away their invention; it was to be their livelihood. Thus, their secrecy intensified, encouraged by advice from their patent attorney, Henry Toulmin, not to reveal details of their machine. At Huffman Prairie, lighter winds and lower air density than in Kitty Hawk because of Ohio’s higher altitude and higher temperatures made takeoffs very difficult, and they had to use a much longer starting rail, stretching to hundreds of feet, compared to the 60-foot 18 m rail at Kitty Hawk. During the spring and summer they suffered many hard landings, real crackups, repeated Flyer damage, and bodily bumps and bruises. On August 13, making an unassisted takeoff, Wilbur finally exceeded their best Kitty Hawk effort with a flight of 1,300 feet 400 m. Then they decided to use a weight-powered catapult to make takeoffs easier and tried it for the first time on September 7. On September 20, 1904, Wilbur flew the first complete circle in history by a manned heavier-than-air powered machine, covering 4,080 feet 1,244 m in about a minute and a half. Their two best flights were November 9 by Wilbur and December 1 by Orville, each exceeding five minutes and covering nearly three miles in almost four circles. By the end of the year the brothers had accumulated about 50 minutes in the air in 105 flights over the rather soggy 85-acre 340,000 m2 pasture, which, remarkably, is virtually unchanged today from its original condition and is now part of Dayton Aviation Heritage National Historical Park, adjacent to Wright-Patterson Air Force Base. Despite progress in 1904, the Flyer was still frequently out of control. The Wrights scrapped the battered and much-repaired airplane, but saved the engine, and in 1905 built a new Flyer III, which included an important design change. The brothers installed a separate control for the rear rudder instead of linking the rudder to the wing-warping “cradle” as before. Each of the three axes pitch, roll and yaw now had its own independent control. Nevertheless, this Flyer offered the same marginal performance as the first two. Its maiden flight was June 23 and the first several flights were no longer than 10 seconds. After Orville suffered a bone-jarring and potentially fatal crash on July 14, they rebuilt the Flyer with the forward elevator and rear rudder both enlarged and placed several feet farther away from the wings. These modifications greatly improved stability and control, setting the stage for a series of six dramatic “long flights” ranging from 17 to 38 minutes and 11 to 24 miles 39 km around the three-quarter mile course over Huffman Prairie between September 26 and October 5. Wilbur made the last and longest flight, 24.5 miles 39.4 km in 38 minutes and 3 seconds, ending with a safe landing when the fuel ran out. The flight was seen by a number of people, including several invited friends, their father Milton, and neighboring farmers. Reporters showed up the next day only their second appearance at the field since May the previous year, but the brothers declined to fly. The long flights convinced the Wrights they had achieved their goal of creating a flying machine of “practical utility” which they could offer to sell. The Wright brothers were certainly complicit in the lack of attention they received. Fearful of competitors stealing their ideas, and still without a patent, they flew on only one more day after October 5. From then on, they refused to fly anywhere unless they had a firm contract to sell their aircraft. They wrote to the U.S. government, then to Britain, France and Germany with an offer to sell a flying machine, but were rebuffed because they insisted on a signed contract before giving a demonstration. They were unwilling even to show their photographs of the airborne Flyer. The American military, having recently spent $50,000 on the Langley Aerodrome a product of the nation’s foremost scientist only to see it plunge twice into the Potomac River “like a handful of mortar”, was particularly unreceptive to the claims of two unknown bicycle makers from Ohio. Thus, doubted or scorned, the Wright brothers continued their work in semi-obscurity, while other aviation pioneers like Santos-Dumont, Henri Farman, Leon Delagrange and American Glenn Curtiss entered the limelight. In 1906, skeptics in the European aviation community had converted the press to an anti-Wright brothers stance. European newspapers, especially in France, were openly derisive, calling them bluffeurs bluffers. Ernest Archdeacon, founder of the Acro-Club de France, was publicly scornful of the brother’s claims in spite of published reports; specifically, he wrote several articles and in 1906, stated that “the French would make the first public demonstration of powered flight”. In 1908, after the Wrights’ first flights in France, Archdeacon publicly admitted that he had done them an injustice. The Wright brothers made no flights at all in 1906 and 1907. They spent the time attempting to persuade the U.S. and European governments that they had invented a successful flying machine and were prepared to negotiate a contract to sell such machines. They also experimented with a pontoon and engine setup on the Miami River Ohio in hopes of flying their airplane from the water. These experiments proved unsuccessful. Replying to the Wrights’ letters, the U.S. military expressed virtually no interest in their claims. The brothers turned their attention to Europe, especially France, where enthusiasm for aviation ran high, and journeyed there for the first time in 1907 for face-to-face talks with government officials and businessmen. They also met with aviation representatives in Germany and Britain. Before traveling, Orville shipped a newly-built Model A Flyer to France in anticipation of demonstration flights. In France Wilbur met Frank P. Lahm, a lieutenant in the U.S. Army Aeronautical Division. Writing to his superiors, Lahm smoothed the way for Wilbur to give an in-person presentation to the U.S. Board of Ordnance and Fortification in Washington, D.C. when he returned to the U.S. This time, the Board was favorably impressed, in contrast to its previous indifference. With further input from the Wrights, the U.S. Army Signal Corps issued Specification #486 in December 1907, inviting bids for construction of an airplane under military contract. The Wrights submitted their bid in January. In early 1908 the brothers also agreed to a contract with a French company. In May they went back to Kitty Hawk with their 1905 Flyer to practice in private for their all-important public demonstration flights, as required by both contracts. Their privacy was lost when New York newspapers heard about the tests and sent several reporters to the scene. Their contracts required them to fly with a passenger, so they modified the 1905 Flyer by installing two seats and adding upright control levers. After tests with sandbags in the passenger seat, Charlie Furnas, a helper from Dayton, became the first fixed-wing aircraft passenger on a few short flights May 14. For safety, and as a promise to their father, Wilbur and Orville did not fly together. However, several newspaper accounts at the time mistakenly took Orville’s flight with Furnas as both brothers flying together. Later that day after flying solo seven minutes, Wilbur suffered his worst crash when still not well-acquainted with the two new control levers he apparently moved one the wrong way and slammed the Flyer into the sand between 40 miles 64 km and 50 miles 80 km an hour. He emerged with only bruises and a cut nose, but the accident ended the practice flights and the aircraft’s flying career. The brothers’ contracts with the U.S. Army and a French syndicate depended on successful public flight demonstrations that met certain conditions. The brothers had to divide their efforts. Wilbur sailed for Europe; Orville would fly near Washington, D.C. Facing a lot of skepticism in the French aeronautical community and outright scorn by some newspapers that called him a “bluffeur,” Wilbur began official public demonstrations on August 8, 1908 at the Hunaudiures horse racing track near the town of Le Mans, France. His first flight lasted only one minute 45 seconds, but his ability to effortlessly make banking turns and fly a circle amazed and stunned onlookers, including several pioneer French aviators, among them Louis Bleriot. In the following days, Wilbur made a series of technically challenging flights, including figure-eights, demonstrating his skills as a pilot and the capability of his flying machine, which far surpassed those of all other pioneering airplanes and pilots of the day. On October 7, 1908, Edith Berg, the wife of the brothers’ European business agent, became the first American woman passenger when she flew with Wilbur-one of many passengers who rode with him that autumn. Wilbur also became acquainted with Leon Bollee and his family. Bollee was the owner of an automobile factory where Wilbur would assemble the Flyer and where he would be provided with hired assistance. Bollee would fly that autumn with Wilbur. Madame Bollee had been in the latter stages of pregnancy when Wilbur arrived in LeMans in June 1908 to assemble the Flyer. Wilbur promised her that he would make his first European flight the day her baby was born which he did, August 8, 1908. Orville followed his brother’s success by demonstrating another nearly identical Flyer to the United States Army at Fort Myer, Virginia, starting on September 3, 1908. On September 9, he made the first hour-long flight, lasting 62 minutes and 15 seconds. The Wrights traveled to Pau, in the south of France, where Wilbur made many more public flights, giving rides to a procession of officers, journalists and statesmen and his sister Katharine on February 15. He trained two French pilots, then transferred the airplane to the French company. In April the Wrights went to Italy where Wilbur assembled another Flyer, giving demonstrations and training more pilots. An Italian cameraman Federico Valle climbed aboard and filmed the first motion picture from an aircraft. After their return to the U.S., the brothers and Katharine were invited to the White House where President Taft bestowed awards upon them. Dayton followed up with a lavish two-day homecoming celebration. In July 1909 Orville, with Wilbur assisting, completed the proving flights for the U.S. Army, meeting the requirements of a two-seater able to fly with a passenger for an hour at an average of speed of 40 miles an hour 64 kmh and land undamaged. They sold the aircraft to the Army’s Aeronautical Division, U.S. Signal Corps for $30,000 which included a $5,000 bonus for exceeding the speed specification. Wilbur climaxed an extraordinary year in early October when he flew at New York City’s Hudson-Fulton celebrations, circling the Statue of Liberty and making a 33-minute flight up and down the Hudson River alongside Manhattan in view of up to one million New Yorkers. These flights solidly established the fame of the Wright brothers in America. The patent illustrates a non-powered flying machine namely, the 1902 glider. The patent’s importance lies in its claim of a new and useful method of controlling a flying machine, powered or not. The technique of wing-warping is described, but the patent explicitly states that other methods instead of wing-warping could be used for adjusting the outer portions of a machine’s wings to different angles on the right and left sides to achieve lateral roll control. The concept of varying the angle presented to the air near the wingtips, by any suitable method, is central to the patent. The patent also describes the steerable rear vertical rudder and its innovative use in combination with wing-warping, enabling the airplane to make a coordinated turn, a technique that prevents hazardous adverse yaw, the problem Wilbur had when trying to turn the 1901 glider. Finally, the patent describes the forward elevator, used for ascending and descending. However, British inventor Matthew Piers Watt Boulton patented the first aileron-type device for lateral control via ‘flexed’ wings in 1868. Boulton’s patent, No. 392, became forgotten until ailerons were in general use, however if it had been revealed at the time of the Wright Brother’s legal filings, the brothers may not have been able to claim priority of invention for lateral control of flying machines. Attempting to circumvent the patent, Glenn Curtiss and other early aviators devised ailerons to emulate lateral control described in the patent and demonstrated by the Wrights in their public flights. Soon after the historic July 4, 1908 one-kilometer flight by Curtiss in the AEA June Bug, the Wrights warned him not to infringe their patent by profiting from flying or selling aircraft that used ailerons. Curtiss refused to pay license fees to the Wrights and sold an aircraft equipped with ailerons to the Aeronautic Society of New York in 1909. The Wrights filed a lawsuit, beginning a years-long legal conflict. They also sued foreign aviators who flew at U.S. exhibitions, including the leading French aviator Louis Paulhan. The Curtiss people derisively suggested that if someone jumped in the air and waved his arms, the Wrights would sue. European companies which bought foreign patents the Wrights had received sued other manufacturers in their countries. Those lawsuits were only partly successful. Despite a pro-Wright ruling in France, legal maneuvering dragged on until the patent expired in 1917. A German court ruled the patent not valid because of prior disclosure in speeches by Wilbur Wright in 1901 and Octave Chanute in 1903. In the U.S. the Wrights made an agreement with the Aero Club of America to license airshows which the Club approved, freeing participating pilots from a legal threat. Promoters of approved shows paid fees to the Wrights. The Wright brothers won their initial case against Curtiss in February 1913 when a judge ruled that ailerons were covered under the patent. The Curtiss company appealed the decision. From 1910 until his death from typhoid fever in 1912, Wilbur took the leading role in the patent struggle, traveling incessantly to consult with lawyers and testify in what he felt was a moral cause, particularly against Curtiss, who was creating a large company to manufacture aircraft. The Wrights’ preoccupation with the legal issue stifled their work on new designs, and by 1911 Wright aircraft were considered inferior to those of European makers. Indeed, aviation development in the U.S. was suppressed to such an extent that when the U.S. entered World War I no acceptable American-designed aircraft were available, and U.S. forces were compelled to use French machines. Orville and Katharine Wright believed Curtiss was partly responsible for Wilbur’s premature death, which occurred in the wake of his exhausting travels and the stress of the legal battle. In January 1914, a U.S. Circuit Court of Appeals upheld the verdict against the Curtiss company, which continued to avoid penalties through legal tactics. Orville apparently felt vindicated by the decision, and much to the frustration of company executives, he did not push vigorously for further legal action to ensure a manufacturing monopoly. In fact, he was planning to sell the company and departed in 1915. In 1917, with World War I underway, the U.S. government pressured the industry to form a cross-licensing organization, the Manufacturers Aircraft Association, to which member companies paid a blanket fee for the use of aviation patents, including the original and subsequent Wright patents. The Wright-Martin company successor to the Wright company and the Curtiss company which held a number of its own patents each received a $2 million payment. The “patent war” ended, although side issues lingered in the courts until the 1920s. In a twist of irony, the Wright Aeronautical Corporation another successor and the Curtiss Aeroplane company merged in 1929 to form the Curtiss-Wright Corporation, which remains in business today producing high-tech components for the aerospace industry. The Wright Company was incorporated on November 22, 1909. The brothers sold their patents to the company for $100,000 and also received one-third of the shares in a million dollar stock issue and a 10 percent royalty on every airplane sold. With Wilbur as president and Orville as vice president, the company set up a factory in Dayton and a flying schooltest flight field at Huffman Prairie; the headquarters office was in New York City. In mid-1910, the Wrights changed the design of the Wright Flyer, moving the horizontal elevator from the front to the back and adding wheels although keeping the skids as part of the undercarriage unit. It had become apparent by then that a rear elevator would make the airplane easier to control, especially as higher speeds grew more common. This aircraft was designated the “Model B”, although the original canard design was never referred to as the “Model A” by the Wrights. However, the US Signal Corps which bought the aircraft did call it “Wright Type A”. There were not many customers for aircraft, so in the spring of 1910 the Wrights hired and trained a team of salaried exhibition pilots to show off their machines and win prize money for the company despite Wilbur’s disdain for what he called “the mountebank business”. The team debuted at the Indianapolis Speedway on June 13. Before the year was over, pilots Ralph Johnstone and Arch Hoxsey died in air show crashes, and in November 1911 the brothers disbanded the team on which nine men had served four other former team members died in crashes afterward. The Wright Company transported the first known commercial air cargo on November 7, 1910 by flying two bolts of dress silk 65 miles 105 km from Dayton to Columbus, Ohio for the Morehouse-Martens Department Store, which paid a $5,000 fee. Company pilot Phil Parmelee made the flight which was more an exercise in advertising than a simple delivery in an hour and six minutes with the cargo strapped in the passenger’s seat. The silk was cut into small pieces and sold as souvenirs. Between 1910 and 1916 the Wright Brothers Flying School at Huffman Prairie trained 115 pilots who were instructed by Orville and his assistants. Several trainees became famous, including Henry “Hap” Arnold, who rose to Five-Star General, commanded U.S. Army Air Forces in World War II, and became first head of the U.S. Air Force; Calbraith Perry Rodgers, who made the first coast-to-coast flight in 1911 with many stops and crashes in a Wright Model EX named the “Vin Fiz” after the sponsor’s soft drink; and Eddie Stinson, founder of the Stinson Aircraft Company. In 1912-1913 a series of fatal crashes of Wright aircraft bought by the U.S. Army called into question their safety and design. The death toll reached 11 by 1913, half of them in the Wright model C. All six model C Army airplanes crashed. They had a tendency to nose dive, but Orville insisted that stalls were caused by pilot error. He cooperated with the Army to equip the airplane with a rudimentary flight indicator to help the pilot avoid climbing too steeply. A government investigation said the Wright C was “dynamically unsuited for flying,” and the military ended its use of airplanes with “pusher” type propellers, including models made by both the Wright and Curtiss companies, in which the engine was located behind the pilot and likely to crush him in a crash. Orville resisted the switch to manufacturing “tractor” type propeller airplanes, worried that a design change could threaten the Wright patent infringement case against Curtiss. Samuel P. Langley, secretary of the Smithsonian Institution from 1887 until his death in 1906, experimented for years with model flying machines and successfully flew unmanned powered model aircraft in 1896 and 1903. Two tests of his manned full-size motor-driven Aerodrome in October and December 1903, however, were complete failures. Nevertheless, the Smithsonian later proudly displayed the Aerodrome in its museum as the first heavier-than-air craft “capable” of manned powered flight, relegating the Wright brothers’ invention to secondary status and triggering a decades-long feud with Orville Wright, whose brother had received help from the Smithsonian when beginning his own quest for flight. Ironically, the Wright brothers were the initial recipients of the Samuel P. Langley Medal for Aerodromics from the Smithsonian in 1910. The Smithsonian based its claim for the Aerodrome on short test flights Glenn Curtiss and his team made with it in 1914. The Smithsonian allowed Curtiss, in an unsavory alliance, to make major modifications to the craft before attempting to fly it. The Smithsonian hoped to salvage Langley’s aeronautical reputation by proving the Aerodrome could fly; Curtiss wanted to prove the same thing to defeat the Wrights’ patent lawsuits against him. The tests had no effect on the patent battle, but the Smithsonian made the most of them, honoring the Aerodrome in its museum and publications. The Institution did not reveal the extensive Curtiss modifications, but Orville Wright learned of them from his brother Lorin and a close friend, Griffith Brewer, who both witnessed and photographed some of the tests. Orville repeatedly objected to misrepresentation of the Aerodrome, but the Smithsonian was unyielding. Orville responded by loaning the restored 1903 Kitty Hawk Flyer to the London Science Museum in 1928, refusing to donate it to the Smithsonian while the Institution “perverted” the history of the flying machine. Subsequently Orville would never see his invention again as he would die before its return to the United States. Charles Lindbergh attempted to mediate the dispute, to no avail. In 1942, after years of bad publicity, and encouraged by Wright biographer Fred C. Kelly, the Smithsonian finally relented by publishing, for the first time, a list of the Aerodrome modifications and recanting misleading statements it had made about the 1914 tests. Orville then privately requested the British museum to return the Flyer, but the airplane remained in protective storage for the duration of World War II and finally came home after Orville’s death. On November 23, 1948, the executors of Orville’s estate signed an agreement for the Smithsonian to purchase the Flyer for one dollar. At the insistence of the executors, the agreement also included strict conditions for display of the airplane. The agreement reads, in part, “Neither the Smithsonian Institution or its successors, nor any museum or other agency, bureau or facilities administered for the United States of America by the Smithsonian Institution or its successors shall publish or permit to be displayed a statement or label in connection with or in respect of any aircraft model or design of earlier date than the 1903 Wright Aeroplane, claiming in effect that such aircraft was capable of carrying a man under its own power in controlled flight.” If this agreement is not fulfilled, the Flyer can be reclaimed by the heir of the Wright brothers. Some aviation buffs, particularly those who promote the legacy of Gustave Whitehead, now accuse the Smithsonian of refusing to investigate claims of earlier flights. After a ceremony in the Smithsonian museum, the Flyer went on public display on December 17, 1948, the 45th anniversary of the only day it was flown successfully. The Wright brothers’ nephew Milton Lorin’s son, who had seen gliders and the Flyer under construction in the bicycle shop when he was a boy, gave a brief speech and formally transferred the airplane to the Smithsonian, which displayed it with the accompanying label. 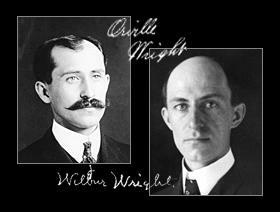 Orville succeeded to the presidency of the Wright company upon Wilbur’s death. Sharing Wilbur’s distaste for business but not his brother’s executive skills, Orville sold the company in 1915. He, Katharine and their father Milton moved to a mansion, Hawthorn Hill, Oakwood, Ohio, which the newly wealthy family built. Milton died in his sleep in 1917. Orville made his last flight as a pilot in 1918 in a 1911 Model B. He retired from business and became an elder statesman of aviation, serving on various official boards and committees, including the National Advisory Committee for Aeronautics NACA, predecessor agency to the National Aeronautics and Space Administration NASA and Aeronautical Chamber of Commerce ACCA, predecessor to the Aerospace Industries Association AIA. Katharine married Henry Haskell of Kansas City, a former Oberlin classmate, in 1926, which greatly upset Orville. He refused to attend the wedding or even communicate with her. He finally agreed to see her, apparently at Lorin’s insistence, just before she died of pneumonia in 1929. “Scipio” was Orville’s famed St. Bernard. On April 19, 1944, the second production Lockheed Constellation, piloted by Howard Hughes and TWA president Jack Frye, flew from Burbank, California, to Washington, D.C. in 6 hours and 57 minutes 2300 mi – 330.9 mph. On the return trip, the aircraft stopped at Wright Field to give Orville Wright his last airplane flight, more than 40 years after his historic first flight. He may even have briefly handled the controls. He commented that the wingspan of the Constellation was longer than the distance of his first flight. Perhaps the last major highlight of Orville’s life was supervising the reclamation and preservation of the 1905 Wright Flyer III, an aircraft that stands equally in importance with the 1903 Flyer. Orville died on January 30, 1948, after his second heart attack, having lived from the horse-and-buggy age to the dawn of supersonic flight. He was followed a day later by John T. Daniels, the Coast Guardsman who took their famous first flight photo. Both brothers are buried at the family plot at Woodland Cemetery, Dayton, Ohio. First flight claims are made for Clement Ader, Gustave Whitehead, Pearse, and Karl Jatho for their variously documented tests in years prior to and including 1903. Claims that the first true flight occurred after 1903 are made for Traian Vuia and Santos-Dumont. Supporters of the post-Wright pioneers argue that techniques used by the Wright brothers disqualify them as first to make successful airplane flights. Those techniques were: a launch rail; skids instead of wheels; a headwind at takeoff; and a catapult after 1903. Supporters of the Wright brothers argue that proven, repeated, controlled, and sustained flights by the brothers entitle them to credit as inventors of the airplane, regardless of those techniques. Aviation historian Charles Harvard Gibbs-Smith is a supporter of the Wright’s claim to primacy in flight. He writes that a barn door can be made to “fly” for a short distance if enough energy is applied to it; he determines that the very limited flight experiments of Ader, Vuia and others were “powered hops” instead.